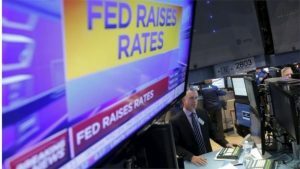 The U.S. Federal Reserved raised its short-term interest rates on Wednesday by one quarter of one percent. It’s the third increase in rates by the Fed since December of 2016. It is a strong sign that the U.S. central bank believes the economy in the country is solid. Fed chairperson Janet Yellen said the move reflects progress made by the economy. In a show of confidence, the Fed also upgraded its economic growth forecast and unemployment for the U.S. in 2017. Rising interest rates will eventually affect millions in the U.S. from buyers of home to those with credit cards to those saving money. However, mortgage rates are not expected to increase immediately. The key interest rate for the Fed will now range from 1% to 1.25%. Overall, interest rates remain very low in comparison to previously. The Fed said as well that it is planning to gradually start selling assets that it purchased during and after the U.S. financial crisis to help give a boost to the economy. The rate hike should not come as a surprise for investors on Wall Street. They estimated that there was a 95% chance the central bank would increase rates following its meeting of two-days that ended Wednesday. The decision by the fed comes following several signs that the economy in the country was in solid shape. Unemployment fell to just 4.3% during May, its lowest point in 16 years. The economy has now added new jobs for 80 straight months. Leaders at the Fed see unemployment remaining close to 4.3% for the remainder of 2017 and dropping in 2018 to 4.2%. Officials at the U.S. central bank also cut their inflation forecast, one of the final indicators to pick up momentum over the past few years. They lowered projections for 2017 to 1.6% from their March estimate of 1.9%. Overall, growth has been slow and steady in the U.S. since 2009, making it one of the country’s longest growth periods in history. The Fed placed its interest rates at 0% during December of 2008 to give the bruised economy and collapsed housing market a boost. However, with the economy in the U.S. much more improved at this time, it does not need as much monetary help from the Fed. This has in turn given the Fed the confidence to start selling off part of the more than $4.5 trillion of holdings that it amassed at the time of and following the recession.